My father-in-law Richard Tomkinson is one of those people who still reminisces about the King Neptune – and still gets angry about the decisions of the City council of the day that led to the iconic restaurant closing forever. “In a town that didn’t have too many alternatives at the time, if you were entertaining you were going to take your guests there to the King Neptune,” Richard says. It had the cachet of Bridges Restaurant on Granville Island in its day, he says. The restaurant was even known abroad – Richard remembers hearing people talking about the New Westminster King Neptune when he was working in Johannesburg, South Africa. The story of the King Neptune itself is an interesting one. It began as a successful small family-run wharfside bistro in 1949, but the real success came after two major crises rocked the Almas family. In 1965 Jean Almas’s husband Jim died suddenly, and in the same year, she was informed the restaurant would have to relocate. 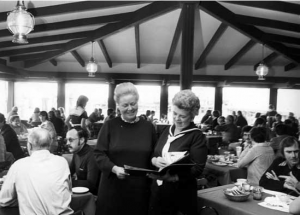 In a time when it was uncommon for women to be in business, Jean Almas made a deal to take over a dilapidated old loading building on the waterfront, gut the interior and renovate it into an elegant 300-seat restaurant. The King Neptune was so good that the Crown Prince of Japan dined there when he came to visit Vancouver. It was where the City held its civic dinners and receptions, wined and dined prime ministers, and a magnet for 1960s and 1970s celebrities. It was New Westminster’s number one tourist attraction. The address was 800 Front Street, on the site where the Fraser River Discovery Centre now stands, right next to Wild Rice’s restaurant. In the early 1980s, the City of New Westminster decided to redevelop the waterfront area, and decided the old King Neptune would just get in the way. The restaurant was unable to work out an arrangement that would allow them to continue operating during construction, and closed in 1982. 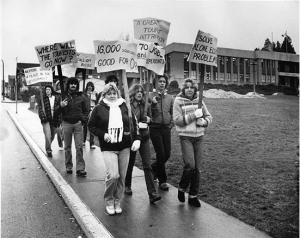 People in New Westminster were so upset that they picketed City Hall and begged then-Premier Bill Bennet to step in to save the King Neptune. Citizens protested the closure of the King Neptune. Photo: New Westminster Museum & Archives. The owners were upset too. 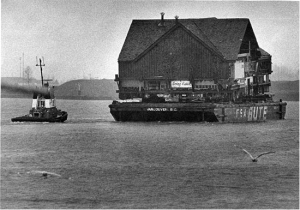 Rather than leave the restaurant ‘for the bulldozers,’ as Neptune co-owner Denis Almas (Jean’s son) said in a February 1982 article in The Columbian, the building was moved from the site and floated to a new location by barge on the Fraser River. The King Neptune restaurant was taken away by barge. 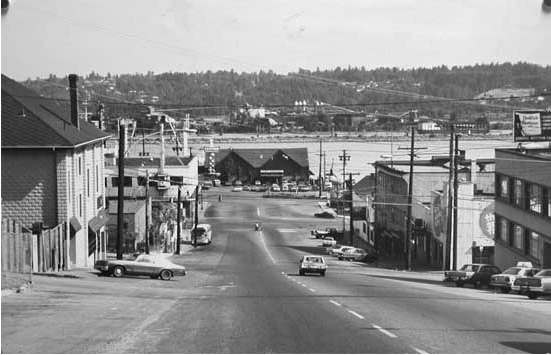 A sign hung on the side reads, “Gone Fishing.” Photo: New Westminster Museum & Archives. “I did find something about a re-opening in Richmond,” says New Westminster Museum archivist Barry Dykes, “But I don’t know for sure if it happened.” Dykes has been unable to find any record in the archives about the new location other than a flyer promising a reopening would be coming soon. New Westminster citizens were furious – and you can hear the pique in my father-in-law’s voice today when he recalls the closing of the King Neptune. “They shut down the King Neptune and did nothing. Nothing happened for years after. Years and years. Mayors went by before anything happened, before the development at the Quay happened,” Richard says. Before & after photos of the location of the famous King Neptune restaurant, after it was forced to close. Photo: New Westminster Museum & Archives. The slow redevelopment of the waterfront resulted in our beautiful Quayside boardwalk, Pier Park and River Market – but it sure took a long time to get there. The process is still underway, with Front Street due for revitalization and new mixed-use developments pending construction on either side of River Market. If you want to experience a little taste of New Westminster’s ‘golden mile’ glory days, buy your ticket to Wild Rice’s Feast On The Fraser Tribute to King Neptune. Tickets are $45 and include a three-course menu of fried oysters, line-caught ling cod with anchovy butter and King Neptune salad, and a Royal City sundae for dessert. 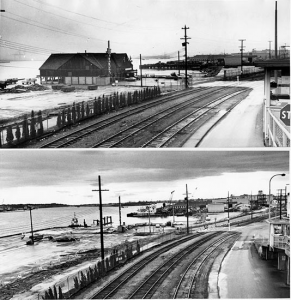 You can learn more about the history of New Westminster’s working waterfront at the New Westminster Museum’s feature exhibition at the Anvil Centre. Just wanted to say great job. I enjoy the pride you take with living in New Westminster and informing us about the events and news going on around town. A good article, Briana. The pictures add a lot, and have some surprises. I thought Spaghetti Factory arrived after KN closed but that great shot shows them both. Great post. Even though I grew up elsewhere I lived here when the King Neptune was open and really enjoyed the place. One note – Jim Wolfe is a local heritage advocate, but he is a planner with the City of Burnaby, not a heritage planner with the City of New Westminster.